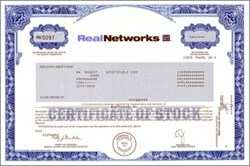 Beautifully engraved certificate from the Real Networks issued in 2002. This historic document was printed by the Security-Columbian Banknote Company and has an ornate border around it with a vignette of the company logo. This item has the printed signatures of the Company’s President and Senior Vice President. RealNetworks, Inc., is a leader in media delivery on the Internet. It develops and markets software products and services designed to enable users of personal computers and other consumer electronic devices to send and receive audio, video and other multimedia services using the Web. Consumers can access and experience audio/video programming and download RealNetworks consumer software on the Internet at http://www.real.com. The company's stock traded over $85/Share in 2000 and is now trading around $6/Share.